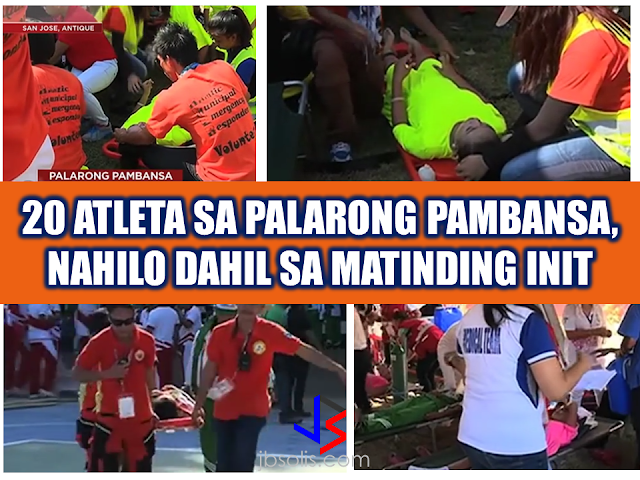 Due to the extreme heat experienced in the country, Antique Provincial Risk Reduction Management Office (PDRRMO) said that at least 20 student-athletes collapsed during the opening of the Palarong Pambansa on Sunday. Five of them were rushed to the hospital in San Jose after experiencing dizziness. The rest were brought to the designated clinics for medical attention. The Department of Education (DepEd), has decided to postpone outdoor games from 10 a.m. to 12 n.n. on Monday to avoid untoward incidents that can be brought about by extreme temperatures. 12,000 athletes at around 26 disciplines are said to be competing on this event at the Binayaran Sports Complex in Antique. It is the first time for the history of the province of Antique to be hosting such events. Themed, "2017 Palarong Pambansa: "Converges Youth Power, Builds Sustainable Future," it is the 60th edition of the Palarong Pambansa with participating athletes from different parts of the country. It is the convergence of best student athletes from 18 regions of the country competing in different events and discipline.